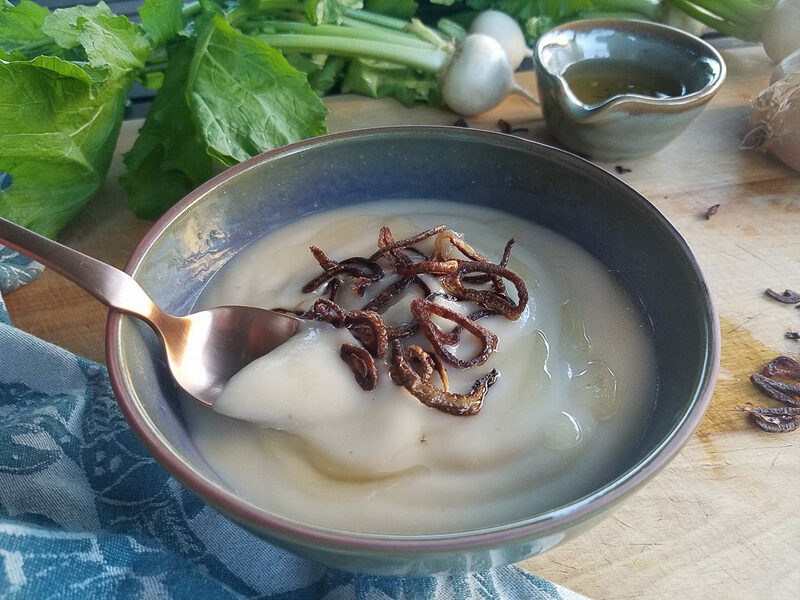 A silky blend of radishes and potatoes crowned with a drizzle of golden shallot oil and toasty fried shallots results in a soup that tastes much more indulgent than the simple ingredients with which it’s made. If you are a regular reader you’ve noticed I’ve been on a bit of a hiatus. Truth be told with the holidays and my real job I just couldn’t find the time to get any good quality posts out. As this seems to be a reoccurring theme lately, I’ve decided to try and minimize my extraneous writing and focus on just sharing a recipe or “flourish” post rather than a story, at least most of the time. I’m also working on incorporating a different recipe format in the future for those who’d like the ability to print the recipe or, honestly, just want to skip the mumbo-jumbo and get right to the recipe. As I make these changes I’d love to know what you think. Furthermore, I have been finding it much easier to share quick recipes on my Instagram and Facebook pages so follow along there too to avoid missing any recipes I don’t include on the blog. And as always, thanks for reading! 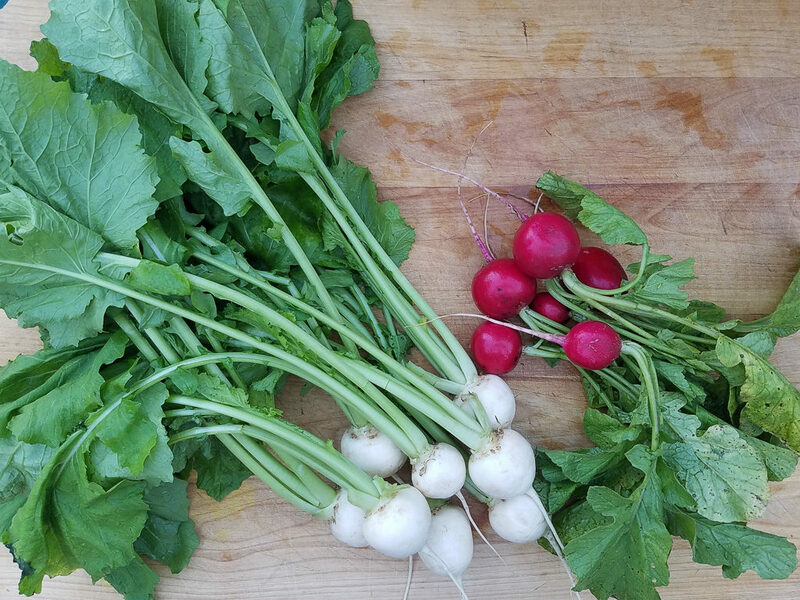 Last week I found myself with a surplus of radishes after finding two new bunches in our CSA share while we still had an unused bunch of large daikon’s from our last share. While putting away these new radishes, I spied the daikons stuffed in the back of the fridge where I’d put them two weeks ago and promptly forgotten them. After being sequestered in the fridge for so long they were looking a little worse for wear so I plunged them into a large bowl filled with ice water and placed them back in the fridge to sit overnight. The next morning the radishes were plump and the greens were as perky as if they’d just been plucked from the ground. Now that I had resurrected the daikons, I found myself staring at the three large bunches of radishes and wondering what I was going to do with them all… Soup! Yep, radish soup. I’d never heard of radish soup but surely there was such a thing? Well if there wasn’t, there was about to be. I’ve roasted radishes in the past and have found the caramelization of the natural sugars results in a slight sweetness which helps to counter their characteristically sharp flavor. I wasn’t quite sure how that sharp radish flavor would translate in a soup so to be safe, and to add a little bit more body, I added a couple potatoes to the mix. 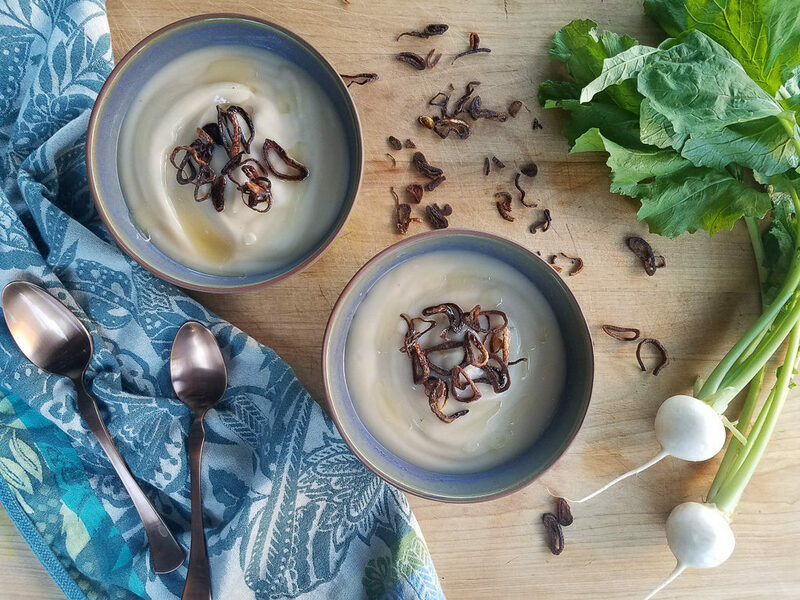 All in all it’s a simple recipe; a quick sauté with onions, followed by a short simmer in broth with some aromatics and a trip through the blender to finish, produced a delicious soup with an unexpected flavor – it reminds me slightly of a beer cheese soup. 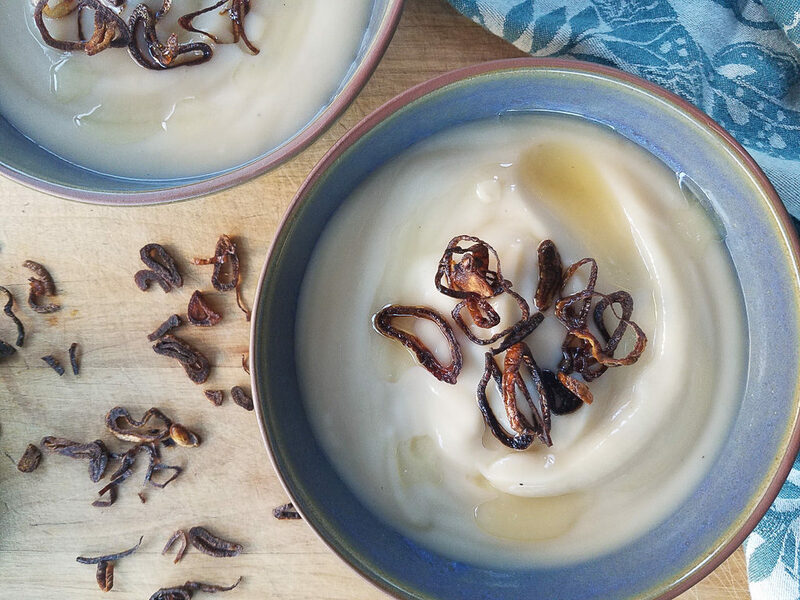 If you’ve never had beer cheese soup, well you’re missing out; it’s fabulous – albeit not the healthiest of meals. I’m not claiming this radish soup tastes exactly like beer cheese soup but it is somehow reminiscent of the yeasty tang, without yeast, or Tang, or beer or cheese for that matter. What it is, is darn good especially for being as healthful as it is. A few notes – Before adding the broth I used white wine to deglaze the pan which is most likely what gives this soup its yeasty flavor so I don’t recommend skipping it. If you absolutely can’t use wine go ahead and deglaze with the broth. As written this recipe is vegan but you can substitute chicken broth if you’re not. 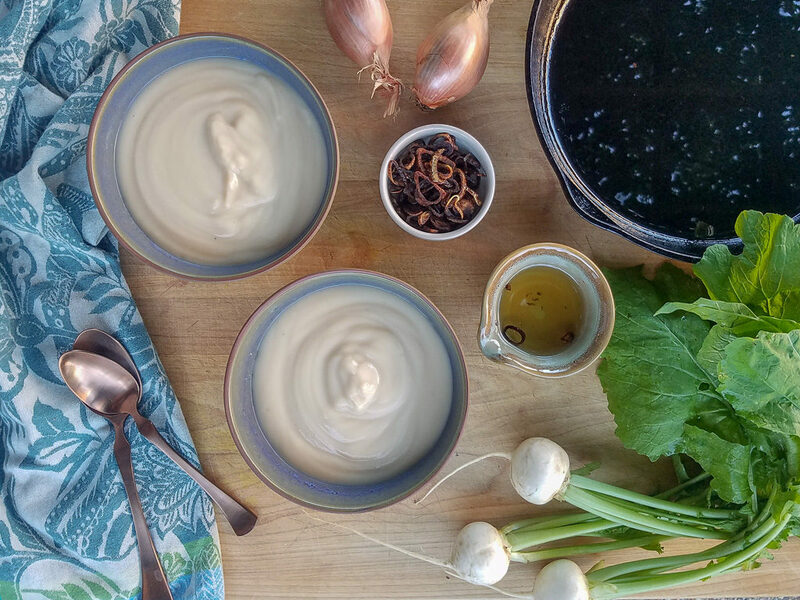 The crispy shallots and resulting shallot oil take this soup up a notch, but if you’d prefer not to mess with them a scattering of sliced green onion would also do nicely. A tip on storing radishes, if you’re not going to use them right away store them root side down in a bowl of cold water in the fridge to help keep them fresh longer. Heat the oil in a soup pot over a medium-high flame. Once the oil is hot add the onions and cook until translucent, about 5 minutes. Deglaze the pan with the white wine, scraping to loosen any browned bits. Stir in the radishes and potatoes then add the broth, bay leaf, thyme and juniper berries. Bring to a low boil then reduce to a simmer for 25 minutes or until the radishes and potatoes are tender. Remove the bay leaf, thyme sprig and berries and spoon the radishes, potatoes and about half the liquid into a blender. Puree the mixture until silky smooth, adding the remaining broth until it is all incorporated. Add salt to taste and a bit more broth if needed to thin. Top with the Crispy Fried Shallots and a drizzle of the Shallot Oil. 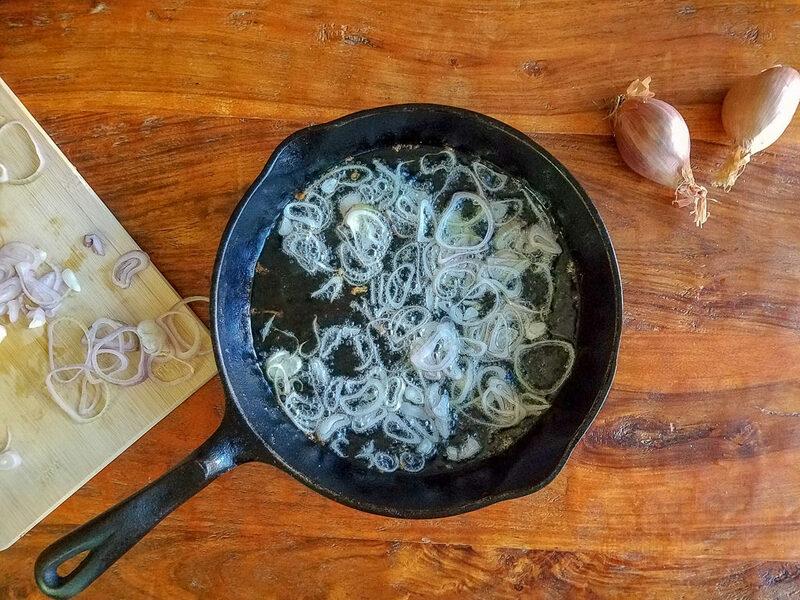 Peel and thinly slice the shallots into rings. Heat the oil in a heavy bottom pan over a medium- high flame. Test the oil to see if it’s hot enough but placing one shallot ring in to the oil, the oil should immediately begin to bubble. When the oil is hot, toss in the shallots, reduce the heat to medium and cook until they begin to turn brown, about 10 minutes. Gently stir or flip the shallots so they brown evenly. Continue to cook the shallots until they are golden brown, another 5 minutes or so. While cooking, watch the shallots carefully and reduce the heat if they begin to get too dark. Remove the pan from the heat and, using a slotted spoon transfer, the shallots to a layer of paper towels to drain. When the oil has cooled a bit strain it into a jar with a tight fitting lid. This oil keeps refrigerated about a week.